One of the biggest dilemmas I faced in switching from the Ning group blogging platform to Blogger was losing the great Ning Comment Wall feature. 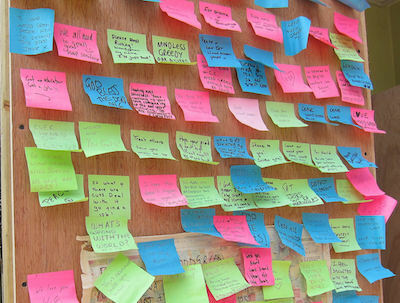 A simple solution — having students create a post called "Comment Wall" at their blogs — has turned out to work just fine! Not as good as Ning's Comment Wall... but definitely good enough! Students do brainstorming and develop their Storybook projects during Weeks 1-5 of the semester, and then in Week 6, they begin commenting on each other's Storybooks. By that time, they have been leaving comments on each other's blogs for five weeks already, so they have become proficient at that, so the Comment Wall makes sense as a mode of communication. They receive feedback on their Storybook in this way for Weeks 6-12, which means every student should get around 10-15 comments total, and sometimes they get more if they are selected as a "free choice" in addition to the commenting group assignments. For five years, I did all the student blogging in a Ning, and I used the wonderful "Comment Wall" on the Ning Profile page for students to leave comments for one another. That was the single best thing about the Ning: the Comment Wall really fostered CONVERSATION, in addition to comments, because it had a "reply" link with every comment, where you could create a threaded conversation back-and-forth between Comment Walls. Admittedly, though, students rarely took advantage of that option, and I suspect that was because the Ning had a strangely impersonal quality (see below) because of the generic design that did not allow individual customization. In any case, I was very sorry to give that up that threaded conversation feature when I switched to the blogs, but I'm still pretty happy with how things have worked out: I use an Introduction blog post which serves much the same function as the old Profile Page did (I should write up an explanation of that also! ), and the Comment Wall post solution has been working just fine. 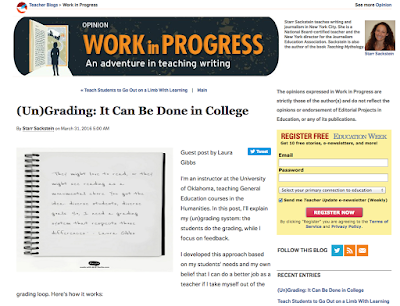 One way in which this solution is superior to Ning is that when students visit another person's Comment Wall, they go in through the blog's main page, using the Comment Wall label to then click on to the Comment Wall. This means they get to see at a glance the person's latest posts, giving them an impression of what that person was doing for class over the past week. In the Ning, the Comment Wall was not integrated with the blog in that way and given how nicely the students are customizing their blogs to create a sense of personal presence, I really like the fact that to get to the Comment Wall you go through the blog home page. Another factor that is contributing to the quality of interchange is how the students are in groups of three for their Storybook comments each week (new random groups each week). So, that means that they are both giving-and-getting comments to-and-from the people in the group. As a result, there is a sense of interchange that results from the round-robin strategy of using the groups. The comments are connected to one another in a kind of conversation among the group members each week. Much of my approach here was driven by the QuadBlogging approach, along with a combination of randomization (so that everybody can meet everybody) and free choice (so that people can connect and reconnect based on shared interests). * Students have an audience for their work that is not just me. * Students tend to provide holistic, personal feedback that is different from the feedback that I provide. * Students learn how to provide feedback by practicing this skill every week while also receiving feedback each week from others. * Students receive feedback in a timely fashion that allows them to improve their project week by week. * Students can access all the project comments in a single place to review each time they spend time working on the project. The switch to Blogger which provoked me to use this "Comment Wall" post solution has been one of the best things that has ever happened in my classes. I had not realized what a negative effect the sameness of the Ning interface was having on the interactions: all the Ning blogs looked more or less the same (in a mini-Ning, students all had to use the same blog design), and all the comment walls looked more or less the same also. With Blogger, the sense of individual student presence and personality is so much stronger than it ever was before, which I think has given a big boost to the quality of the comments overall, with much more of a person-to-person dimension. I am very pleased with both the blog commenting and also the project comments at the Comment Walls!